We offer air freight forwarding to companies and individuals alike. If you’re looking for door to door service, utilising our network of world-wide agents with whom we have had many years of working together, we’ll take care of your Air Freight shipment from origin to destination to include Customs clearance and of course, our regular shipment updates. Our door to airport service can provide you with the choice of using your own Customs agent at your airport of destination. We’ll still give you the same excellent service and updates but you’re agent will take over your shipment on arrival. To benefit from improved rates, you can use our consolidated service. This is where we group several Air Freight consignments for the same destination into a consolidation under one master AWB. Each consignment can be issued with it’s own House AWB. You benefit from our consolidated rate and can select a door-door or door-airport service only. 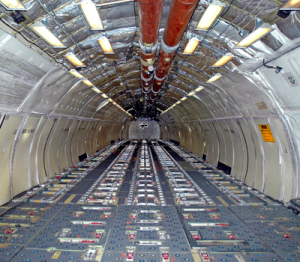 Freight or cargo that does not fit normally in one of the standard air freight containers is considered out of gauge and will often require specialist packing or a dedicated air cargo service. If you have a requirement for OOG cargo, just let us know. The way we track our clients shipment is where we are different. Many companies will provide you with a tracking number which you have to enter into a website to get your own updates when you feel you need an update. EBISS will do this better. We have key stages throughout a shipments progress that we send you a personalized email (or phone call) update on your air freight shipment’s status. Many carriers websites will say ‘awaiting international Customs release’ We will tell you when the entry was presented to Customs and when release can be expected. This gives you not only peace of mind but a realistic time frame for when your shipment will be delivered. When you have an unusual shipment that requires a charter aircraft, we’ll check routing, timescale and payload to establish the most suitable aircraft for your needs. We can offer part-charters, backloads and other solutions, as you need. We can supervise aircraft loading and unloading and co-ordinate the specialist equipment that your shipment may need. If you’re relocating, attending University overseas, sending personal effects to loved ones overseas or need to send extra baggage, EBISS can help. We can organize to pick-up your personal effects, pack them and organize for their delivery anywhere in the world.